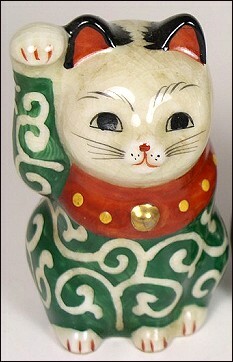 This guy is said to be an antique Manekineko & he looks it. I fell in love w/ him at first sight & now he's my most prized Welcomer Cat. I like his expression, his bearing, & his colors. My wife says that he reminds her of her father. Porcelain, 5" (12.5 cm) tall. [Note the height of his raised paw.] (Seto-style Meiji?) Black on brown spots. 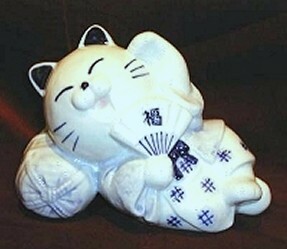 A cute white-porcelain Neko incense burner, sitting in the middle of an elegant dark-gray (silver sheen) porcelain plate. ID: Both have "Kotobuki, Japan" stickers. From Otherlands Gifts, Memphis. 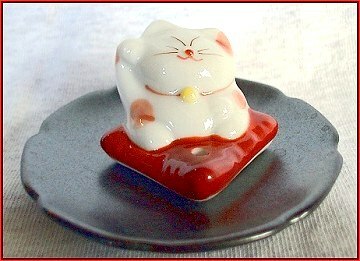 Cat is 1.25" (3.5 cm) tall, plate 3" (7.6 cm) wide. Super cute! 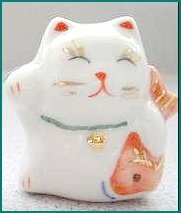 A small 1 7/8 in (5 cm) tall white porcelain Neko carrying her fish under her arm. 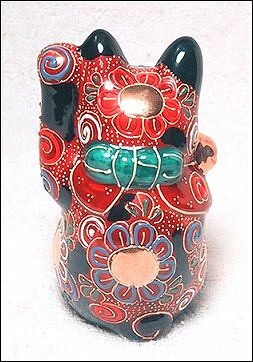 (One of a mirror-image Maneki Neko pair -- the other now in Diane's collection in San Antonio.) Purchased new from Honolulu eBayer "biggggg". 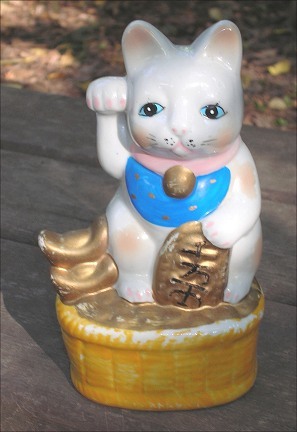 A sweet Lucky Cat sitting on a basket of gold coins & ingots. Reminds me a bit of the Beatrix Potter figurines. 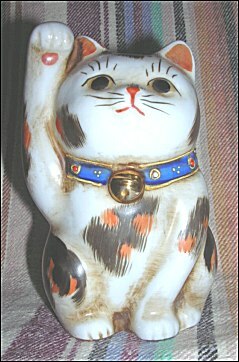 But this kitty is here to work -- He's a bank & he's obviously beckoning for wealth. A basketful to be precise. 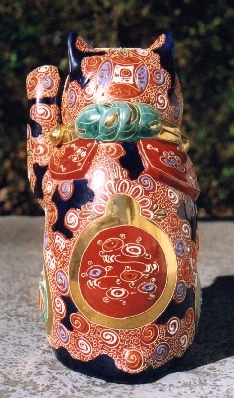 Approx 6 3/8" (16.5 cm) tall, painted porcelain. 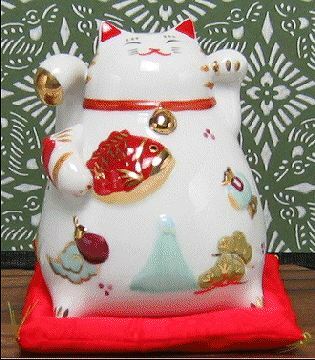 A Seto-style Welcomer Kitty from the Shiki Store in Japan Centre, this pretty girl wears an angelic smile & a very fancy bib collar. She's 8.75" (22 cm) tall, made of porcelain, & bears a small, octagonal, purple-blue paper sticker. Her tri-color spots are textured black & blue. 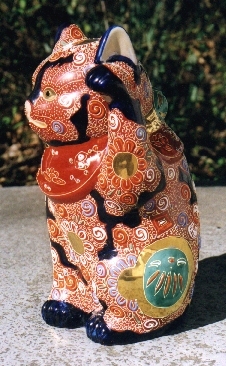 Purchased in Japantown, San Francisco, 2004. 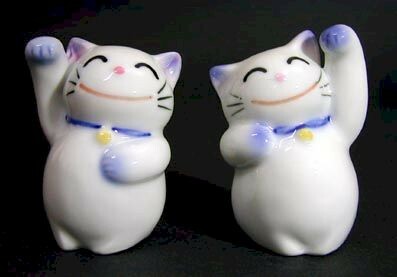 A grinning-like-crazy pair of handmade porcelain Lucky Cats. Two 2.6" (7 cm) tall Arita, Japan, miniatures from the IHEI company of Japan bought new via the "Artistic Nippon" website. A birthday present from my sister, Sue, who so admired them that I convinced her to keep one. I have the right-handed guy & she has the left. 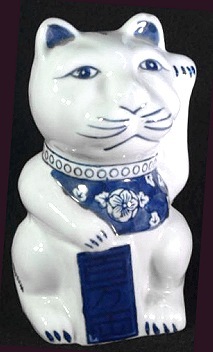 Another white w/ blue IHEI Good Fortune Feline from Sister Sue, also from "Artistic Nippon" in Japan. 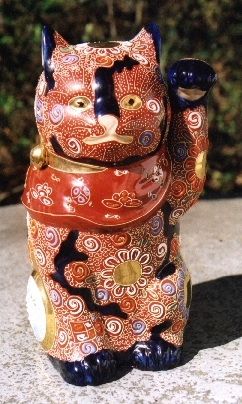 A beautifully-made stripey cat w/ a red painted collar. 2.75" (7 cm) tall. Porcelain. 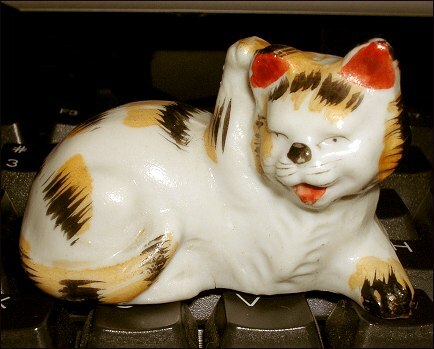 A way-cool Good Luck Cat bank, this guy was my 1st eBay purchase. Made of porcelain, he's got a red cloth bib, a gold metal bell, & a big red cloth pillow. 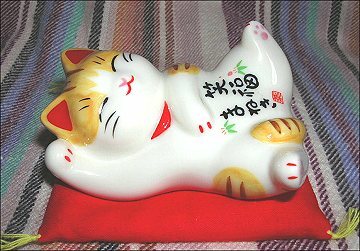 5" (12.5 cm), he's named "Zabu-Neko", which I believe means "Pillow Cat". From Lynne, CA, 1999. I purchased this big boy directly from a Japanese seller's website. 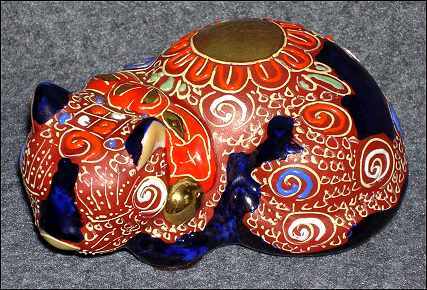 He's made of beautifully decorated porcelain & he came w/ a real bell & pillow. 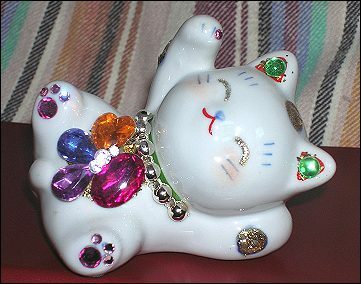 He has a very long tail for a Maneki & is definitely related to several other Nekos in my collection, such as Zabu, above. 4" (10 cm) tall, a bank. Another Zabu cousin (this is a large family), this funny Welcomer has a single gold tooth in front. He's porcelain with a real bell & fancy green pillow. 4" (10 cm) tall, a bank. 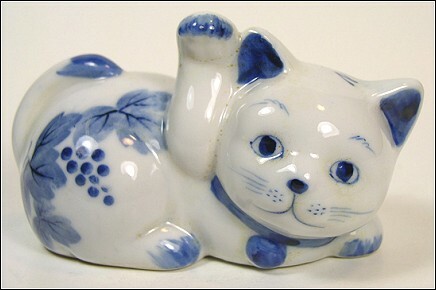 From Old Japan, Inc., online: One of a pair, this sweet-looking Good Fortune Cat is porcelain, covered with a celadon-like crackled glaze, & painted with a green karakusa (vine-like) pattern. 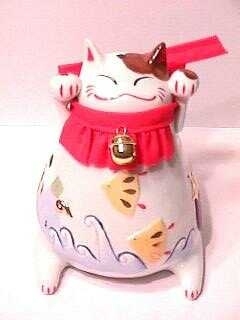 Bought in 2004, she originally came from Japan, has a red chop mark underneath, & is 3.5" (9 cm) tall. Her twin is owned by fellow-collector Teddi ("Hi, again, Teddi!") of New England Bonsai Gardens. 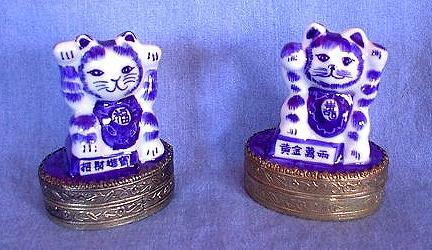 Two 3" (7.5 cm) Neko wishboxes: One left-handed; the other right. The blue-on-white porcelain figures are mounted onto handmade, oval-shaped, silver-washed copper boxes w/ mirrors inside (where you can place your written-out wish). Instructions & the "Tama" story were included with each. PS: The right-handed one with the Fuku symbol (meaning "happiness") is mine; the other now lives in England. I like white-with-blue cats, so I grabbed up this unusual guy & am very happy to have him. 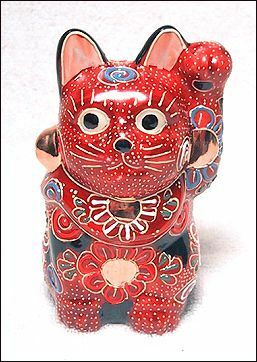 I say "unusual" because I've never seen a Lucky Cat with this face & decoration, nor a rectangular coin so dark that the characters on it are nearly invisible. He's porcelain & 6.5" (16.5 cm) tall. Purchased from a California eBayer, it's been suggested -- based on his hibiscus flower pattern -- that he might be Hawaiian. 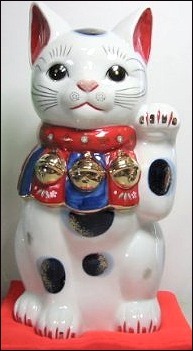 A very fine Kutaniware Maneki Neko decorated w/ exquisite gold detail work & moriage. 9.5" (24 cm) tall. A square-shaped pattern is stamped onto the bottom. From Chou's Imports, Memphis, 1998. An early Christmas gift from my wife, Bren. Chou's had two matching Nemuri Nekos - one medium-sized & the other small. I purchased the medium one to sell on eBay and, several years later, purchased the small one for keeps. This is the small Nemuri. 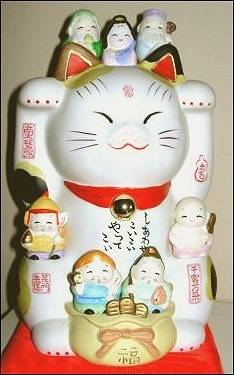 Made in the same style as the large Maneki Neko, but only 4" (10cm) long. Note the red Kutani mark on the underside. A Beautiful Beckoning Kutani Kalico with textured markings & a brightly painted moriaged collar. Said to be 20-30 yrs old. Purchased from online Old Japan, Inc (Boston), who brought him from Japan. 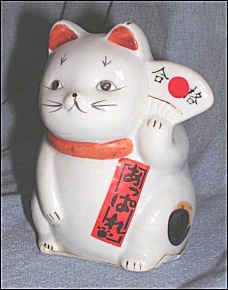 He's porcelain, 4.5" (11.5 cm) tall, with ID: a white paper Old Japan price sticker & an unfamiliar embossed design - perhaps identifying the maker. A Kutani Kat dancing! Kutani Ware (Ishikawa) from Kaburaki Shoho studio, Japan, via online seller site "b-zenjapan". New, 4" (10 cm) tall. ID: 2 embossed designs are underneath - a circular one & a kidney-shaped one - neither clear enough to make out. Another Kutani Kitty, this guy with a different background color. 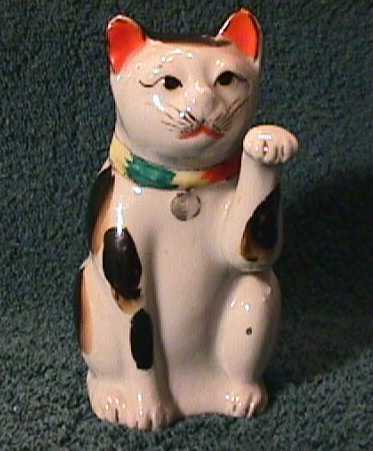 Porcelain, 4" (10 cm) tall, w/ an oval gold sticker, "ORIENTAL TRADING, INC. / DALLAS, TX. / MADE IN JAPAN"; plus a difficult-to-make-out round impression on the bottom. New from eBayer "winniou" (CA). Note: "Kutani" or "Kutaniware" is a very desirable type of porcelain associated-with or produced-in the kilns of the Kutani region in Japan. 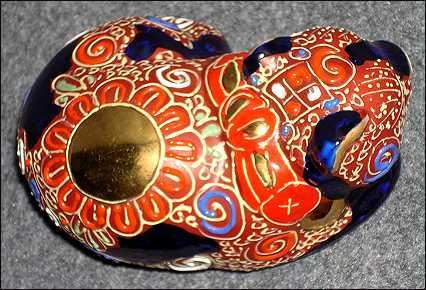 It will often have raised enamel details, such as outlines, dots, or patterns, called "moriage". A very pretty & nicely-made tabby Neko taking a nap. She's porcelain, 3.75" (9.5 cm) long, & has a familiar purple octagonal sticker onboard. A present from Barbara & Larry. 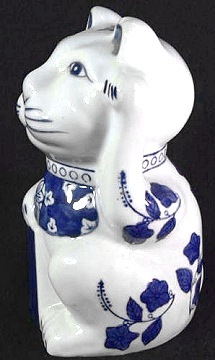 An unusual white w/ blue grapes & leaves -decorated porcelain Lucky Cat. 20-30 yrs old. With a square blue chop mark on the glazed bottom. 4.25" (10.5 cm) long. From Japan, via Old Japan, Inc.
 A Lady Maneki showing off her jewelry. From Taiwan via eBayer "evaevamei". 3.5" (9 cm) long. White porcelain, glitter paint, & rhinestones. 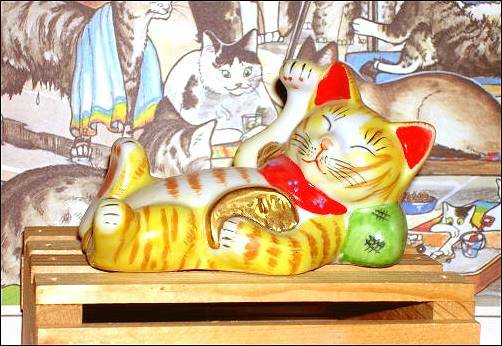 This yellow tabby Welcomer is a Christmas present from my Sister Sue & her family. He's Kutani porcelain, 4.5" (11.5 cm) wide, & marked with 2 impressed (& illegible) characters underneath. New, from the b-zenjapan site, Kutani Lucky Break Shop, Ishikawa Prefecture, Japan. A favorite of mine as I like tabby cats. A white-with-blue porcelain Geisha Girl wearing 4 "fuku" characters. Looks lucky to me. From a Hong Kong eBayer in 1999. 7" (18 cm) wide. The lightly tinted pink mouth is a nice touch. Note that she's lying on a bag of rice - a symbol of abundance. This calico cat reminds me a bit of my own China-China-China kitty. She's made of painted porcelain of the thinnest kind. About 2.5" (6cm) in length. On her underside she has "(c)M.K" / "JAPAN" stamped in black. Unusual!